Survival Relay: Run a relay using gear as the batons. (2 to 4 players). This is conducted on the normal racetracks. Survival Ball: Use gravity control to shoot the ball and score. (1 to 4 players). The action here is somewhat like a fast-paced, less accurate version of Silver's billiard psychokinetic puzzles in Sonic '06's Dusty Desert. It comes with three unique courses (each a blocked-off segment of a main game course): Megalo Junction (Megalo Station); Botanical Cave (Botanical Kingdom); and MeteroTech Arsenal (MeteorTech Premises). Survival Battle: Slam foes with objects using gravity action. (1 to 4 players). 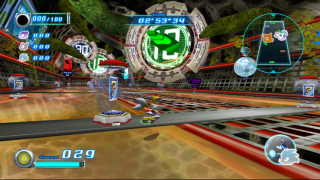 This is the familiar format from Sonic Riders' Battle Mode of Dual Towers, Snow Valley, and Space Theater. Pick up missiles as power-ups and launch them at opponents. All the levels are in Astral Babylon type space arenas. This page was last edited on 4 January 2012, at 22:03.